Nissan has partnered with Amazon.com to titillate the masses with yet another mysterious container holding a vehicles and other goodies. This time they've dumped a massive Amazon Locker in downtown San Francisco and have announced there's a new Rogue SUV inside. What else could they mean by "you can't miss the Nissan Rogue when it's inside a #GiantLocker"? Which is a weird thing to say, because it couldn't be easier to miss. You can't see it at all. 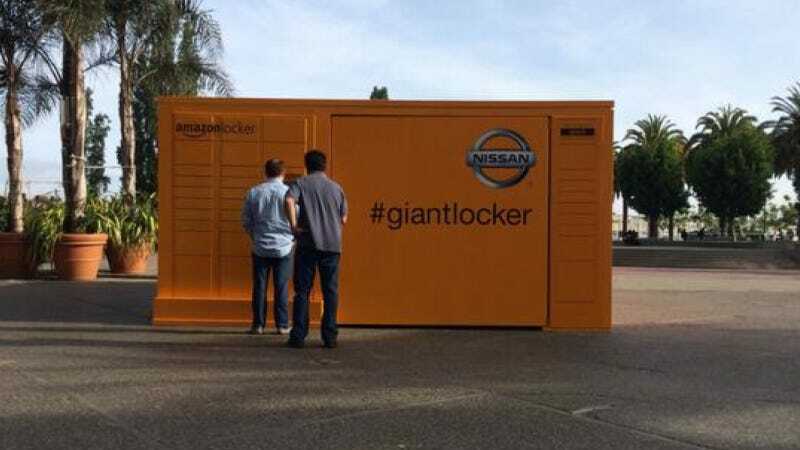 Business Insider says Nissan is encouraging people to take pictures with the box (duh) and post 'em to Twitter with the tag #GiantLocker. Apparently everyone who does gets a code, and each of those codes opens a little door on the locker, allowing access to prizes for participants. One code opens the big door... and bestows a new Nissan Rogue to the recipient, who is lucky I guess. The stunt's also promoting the Amazon Locker program; Amazon's delivery scheme that puts little lockers in 7-Eleven stores in New York City, Seattle, and parts of California for people who don't want stuff sent straight to their house or apartment. You can get an item shipped to the locker and open it with a code emailed to you by Amazon. It's a little more practical than drone delivery, for now.